At the 2016 Digital Kids Summit in San Francisco, California, earlier this week, two researchers from Intel, Dr. Anne McClard and Dr. Thérèse Dugan, presented their research and insights on how toys, culture, and technology influence children. At Intel, studying children’s play is far from a game. The data included more than a thousand parent and child participant surveys, observations, and in-person interviews in the United States, Germany, and China. Although the study’s findings are far from conclusive, they suggest a relationship between the toys children own and their interests later in life. 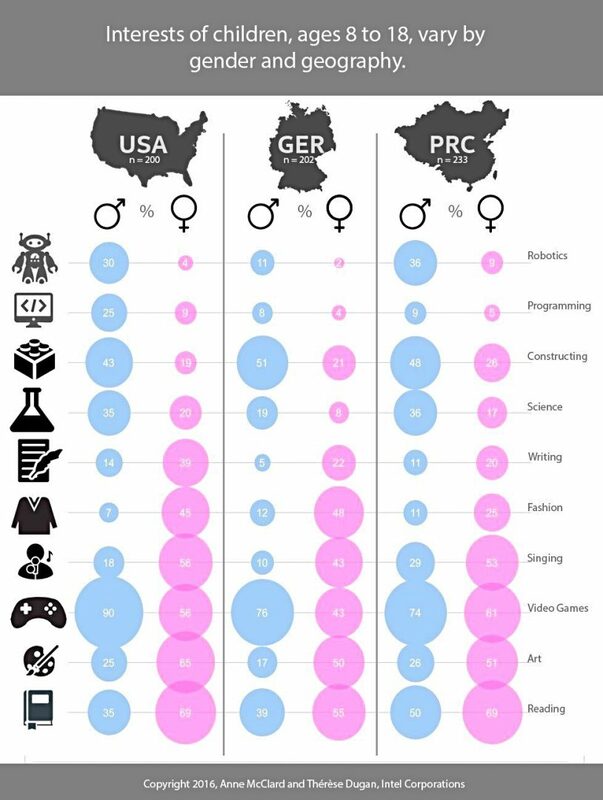 The study found that pink and blue toy categories are dominant in society. Dolls, teacup sets, and dress-up kits are encouraged for girls, while boys are bombarded with building tools that sharpen spatial skills and teach the foundations of engineering. Even if some toys are encouraged for both genders, the boy version will have a higher complexity. Pink Legos, Barbie Engineers, or a single gender approach will still leave much potential unfulfilled. Young women can be strong, confident, and love engineering, but humanity also needs men emphatically supportive of girls pursuing engineering. Interestingly, companies like GoldieBlox and Roominate address the issue by creating toys and games for girls to develop an early interest in engineering and confidence in problem-solving. Games like Minecraft appeal equally to boys and girls, a good example of gender neutrality — especially in the United States. The findings from McClard and Dugan’s research indicate that the toys kids use may have a relation to the interests children develope later in life. With the entrance of smart toys in the market, parents, teachers, and industry have an opportunity to enable boys and girls to gain the 21st-century skills needed to succeed in the future. A good toy today means greater potential for families, communities, nations, and businesses tomorrow — not mere child’s play.